need art? jump on it! Eight months ago I had a fall cleaning … the doc went in and cleaned out all of my endometriosis. It was stage 4; there are only 4 stages. Four days ago I had a spring cleaning … the doc went in and cleaned out my endometriosis, scar tissue and adhesions, removed a cyst and untangled my ovary, which had become “one” with my fallopian tube. Eight months ago I believed I’d be pain/symptom free for two/three years, the average time endo remains “dormant” following a clean out and back-to-back birth control. I had six months before the pain took control of my life. Again. The recovery from this second surgery makes the memories of the first seem like a paper cut in comparison. I’ve never felt such excruciating pain — and subsequent fear — in my life. Going into Tuesday, I was terrified of what they’d find — or, more honestly, of what they wouldn’t. I couldn’t have handled a non-cause, a long, endless list of possibilities. Certainties you can face, head on, it’s the mysteries that leave you breathless. Or, so I thought. My biggest fear, aside from not knowing, had been the idea that I couldn’t be a mommy again. Cooper would be such an amazing big brother and it is written on my heart, on my soul, to see that dream come to fruition. If I can’t bake my own baby, there are, of course, other options, other equally beautiful avenues. But now, sitting here, crumbling in a bout of pain uneased by meds, I am faced with an ugliness I hadn’t imagined: a life unlived. There is no cure, no absolute fix for endo, even complete removal of all things “mommy makers” isn’t a guarantee for pain-free days. I have yet to find a pain med that eases my symptoms and allows me to be, well, me. Chronic pain inhibits my ability to be the kind of wife, daughter, friend, sister, aunt and, above all else, mother, I want to be. I can’t miss out — I refuse to miss out — on the little moments of Cooper’s life because my body chooses to glue itself into a mass of ugly. But, I have yet to find the strength to push through the pain. Chris and I have an appointment with the infertility specialist next week and a post-op appointment with my surgeon the next. I’m praying for answers, for help, for strength, for a light at the end of it all. 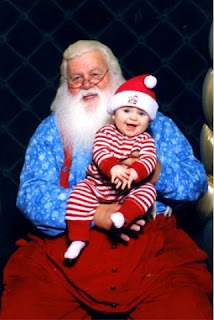 7-month-old Coopie and Santa: besties! 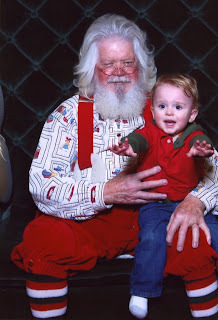 19-month-old Coopie and Santa: mortal enemies! 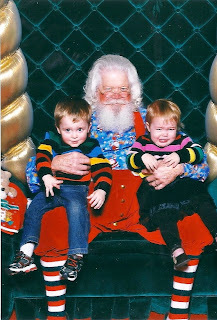 2.5-year-old Coopie and Santa: frienemies! :) (Although jolly ol' St. Nick still seems to be on cousin Montana's naughty list). You are doing that thing, right now, this very moment. Be proud of your bravery, of your strength, even on the days when you forget you are being brave, being strong. "Faith is taking the first step even when you don't see the whole staircase." — Martin Luther King, Jr.
You’ve taken the first step, and the second and the third. 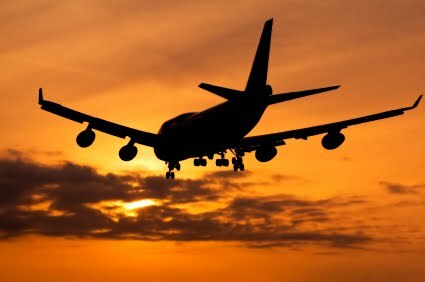 Each day is a new step toward a new adventure, a new life. Trust that the staircase will lead you where you need to go. It does. It is. It will. I promise. thanks for the reminder, K ... words have power and meaning, it doesn't matter who writes them, it only matters that they were and that they're shared. update: Unfortunately, I have no encouraging news to report on Avery’s condition (my coworker Amy’s daughter). She’s still very ill and doctors are now looking at possible surgical procedures (ear/nose/throat). My office held two benefit events last week, which raised more than $1,600 (with an additional $550 added to that, which came from the kindness of strangers) … a wonderful success, however Amy was taking care of Avery and unable to attend. When Amy stopped by the office briefly to complete a couple of projects, she was gifted with the donations. She was completely touched and overwhelmed by the outpouring of love and support by both her coworkers and perfect strangers. On a side note … there’s a very special book on its way to Avery. My amazing mom, who believes in the power and beauty of words, sent a note to author Dallas Clayton (veryawesomeworld.com) upon hearing of Amy and Avery’s situation. For every copy of “An Awesome Book” Dallas sells, he gives one away. 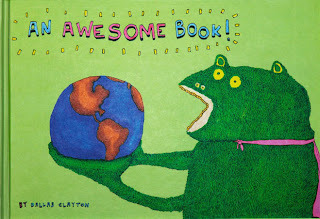 Having purchased the children’s book as a 30th b-day gift for me (the message is universally appealing and inspiring), my mom is very aware of how, well, awesome the story is … which is made even awesomer (yes, that’s a word) by Dallas’ pay it forward attitude. And yay (!!!) he’s paying it forward to Avery… a signed copy is in the mail. Thanks again to everyone who has sent prayers, donations and unexpected words of awesomeness to Amy and Avery … here’s to the continued greatness that is the kindness of strangers.